The Flyknit material and Zoom technology of the shoe may have worked as intended because many users agree that the Nike KD 9 is lightweight. A lot of buyers appreciate that Nike created different colorways for this shoe model; the design is aesthetically nice on and off the court. The cushioning provided by the Zoom technology is loved by plenty of wearers because of its phenomenal impact protection. The honeycomb traction is praised by a great number of reviewers because it performs well on any kind of court. The inner padding of the shoe gives a nice amount of comfort to the ankle, reported numerous buyers. Many reviewers leave comments that the shoe is versatile because of the Flyknit and Zoom cushioning in it. Some Nike KD 9 owners are happy with the $150 price, saying that it is such a good price for a signature shoe. This model has the same price as the 11th Nike KD kicks. A handful say that the shoe model needs time to break in, especially in the area where the forefoot material meets the back area. Multiple buyers say that because of the softness of the Flyknit textile, the Nike KD 9 lacks ankle support and can cause injuries. The width of the shoe runs narrow. New buyers with wide feet are advised to steer clear of the shoe model. A few buyers left comments that the one-bootie design of the shoe does not provide a good amount of lockdown; it causes foot slippage inside the shoe. A lot of wearers complain that the shoe is difficult to put on and remove. Basketball shoes with a single-construction, including the generally well-reviewed LeBron 16, have this issue. The Nike KD 9 is a shoe that delivers despite some negative comments on its size. The shoe model, when worn, feels low to ground. This is a perfect shoe for fast players like point and shooting guards. If you are an athlete with quite narrow to normal feet who adore basketball sneakers with good impact protection, the Nike KD 9 is the shoe for you. Overall, definitely get these; these are a freakin dopea** shoe! Getting all this for $150 is exactly what we should be getting. $150 isn’t exactly chump change. Best. KD. EVER. Seriously. Besides a little less support than some need, there are no problems with this shoe. Released in August 2016, the KD 9 is the ninth signature shoe installment of Nike for Kevin Durant. It has the Flyknit technology in the upper and Zoom technology in the midsole. As for the outsole, it has the unbeatable honeycomb traction. All three features in one shoe make an exemplary experience. Cushion. The responsiveness and bounciness of the Nike KD 9 come from the combination of phylon and Zoom technology in the midsole. Phylon is a responsive, lightweight, and low-profile EVA foam placed on top of the midsole. It helps increase the cushioning and flexibility of the shoe. The full-length Zoom technology is located below the Phylon. It is an ultra-thin sturdy unit that provides superb maneuverability while giving a good court feel. Traction. The outsole of the Nike KD 9 has a honeycomb pattern. The pattern is designed to support the multidimensional movements of quick athletes like Durant. The rubber outsole has a good court grip on both indoor and outdoor courts. However, the outsole rubber is quite soft, so playing with the shoe outdoors will be a risk. Length and Width. Designed according to Durant’s foot structure, the Nike KD 9 is built for users with narrow feet. Wide-foot wearers are advised to go half a size up if they really want the shoe. If the athlete wears shoe braces, it is recommended that they bring the braces to a store and try the shoe with them. Lockdown. The Nike KD 9 is designed to fit like a glove. The textile is knitted tightly in order not to overstretch in time. To obtain a more secure hold on the foot, the round shoelaces can be tightened. The upper of the KD 9 is made of Flyknit, making it well-ventilated. It has nylon inside to enhance the shoe’s durability. It is also comfortable and easy to put on. The Nike KD 9 is a mid-top with a one-bootie construction. The Nike Swoosh is on both sides of the shoe. To showcase it as a signature shoe, the heel counter has a pull tab and logo of Kevin Durant. The insole also has his signature. To let the audience know the technology used on the shoe, a tiny NIKE ZOOM callout is displayed on the lateral side. Since the release of the Nike KD 9, multiple colorways have been released. Some of such colorways take inspiration from Kevin Durant’s life. They are discussed in the subsections below. Kevin Durant’s love for his Aunt Pearl is so great that there is a special colorway dedicated to her for every shoe model that he has. Durant’s mother worked long hours when he was young and his Aunt Pearl took the responsibility of looking after him. She encouraged and supported his dreams of becoming a basketball player. But as much as she wanted to watch his basketball games live, she can only cheer for him at home because her lung cancer prevented her from travelling. After fourteen years, she surrenders to cancer with KD by her side. In 2012, Kevin Durant made the colorway dedication an annual tradition to keep his aunt’s memory alive. The Nike KD 9 Aunt Pearl has a simple black upper with accents of hot punch pink to allude to the Kay Yow Cancer Fund. It has been reported that the Aunt Pearl colorway of every Kevin Durant signature shoe model is the most sought-after in his series. The Battle Grey colorway of the KD 9 is made of varying shades of grey. Kevin Durant debuted this shoe in his first game as part of the Golden State Warriors. The Baylor PE is one of the brightest colorways of the Nike KD 9. This colorway comes with a black upper that feature eye-catching volt accents on the shoelaces, Swoosh, midsole, and outsole. In celebration of the Black History Month, the 2017 BHM colorway features black, white, and metallic gold. The Birds of Paradise colorway is inspired by Kevin Durant’s week-long trip to China with Nike designer Leo Chang. The colorway is also reported to be inspired by the 42 bird species found in Asia and Australia. The bright teal and green colors of the birds are found on the KD 9’s upper, which sits on a black base and white outsole. Set to release a few days before Christmas 2016, the Sauce colorway is presented in a combination of metallic red bronze and deep burgundy. In celebration of the US basketball team’s win in the 2016 Rio Olympics, the Gold Medal colorway of the KD 9 is released. The shoe’s black upper is accented with a gold Swoosh, red collar and inner linings, and blue midsole and outsole. When Kevin Durant moved to the Golden State Warriors, he dedicated this colorway to his new team. He wore this in a match against the Los Angeles Lakers, in which they were victorious, 123 to 112. There are reports that this PE colorway is not as easily accessible as the others. The KD 9’s Hard Work colorway references Kevin Durant’s grueling workouts to improve his game play. The color combination on it makes it look like it belongs to the Air Jordan series. It has a red upper with black stitches, a white midsole, and a white Swoosh. The Hard Work colorway reminds of the OG Air Jordan 1. The Home II colorway is inspired by the Oracle Arena, which is the home of the Golden State Warriors. The KD 9 Home 2 comes with a blue rear panel. The rest of the shoe is predominantly white with hints of blue. The Multicolor colorway was worn by Kevin Durant in another victorious game against the Los Angeles Lakers scoring 112-107. It comes with a white rear panel, multicolor forefoot, and translucent outsole. Also known as the On-Court colorway, the OKC Home is supposedly dedicated to the Oklahoma City Thunders. However, with Kevin Durant’s sudden move to the Golden State Warriors, the release of the OKC Home colorway was delayed. These blue basketball shoes have black accents and a white Swoosh. The Oklahoma PE colorway became controversial to the fans of Oklahoma City Thunder. They are not happy that Durant will be playing for their rival. The Nike KD 9 Oklahoma PE is a white and red upper with a speckled white midsole. The Oregon Ducks is a football team that did an exhibition basketball game. They received an exclusive Nike KD 9 in an entirely yellow base with a green Swoosh and rear KD logo. They received another PE of the Nike KD 9 in interchanging colors. The Nike KD 9 Texas is dedicated to Kevin Durant’s beloved college alma mater. He said, “Attending UT (University of Texas) was one of the best experiences of my life and launching the Nike KD 9 back in Austin this past June reflects my love for the college experience I had 10 years ago.” Burnt orange accents provide contrast to the off-white Flyknit upper. Durant’s jersey number 35 is on the tongue. The Texas colorway is one of the few KD 9s to have a gum rubber outsole. The Nike KD 9 Texas Longhorns is another exclusive for Kevin Durant’s alma mater. The white forefoot is paired with a light blue rear panel. The Swoosh and shoelaces have bright orange accents. During the 2016 Rio Olympics, the Unlimited colorway was released with the Birds of Paradise colorway. It features a black upper with neon pink and and neon green highlights. With their Fighting Ducks uniform, the Oregon Ducks wore an exclusive for Veteran’s Day. The shoe features a clear outsole with a black upper. Accents of yellow and green and a speckled midsole give life to these kicks. In a game against the Toronto Raptors, the Golden State Warriors Big 4 wore their respective new signature shoes. Kevin Durant rocked a KD 9 with a white upper that has blue and yellow accents like their GSW jerseys. Nike KD 9 Cargo Green. Set in military colors, the Cargo Green colorway comes with multicolored shoelaces and volt Zoom cushioning. Nike KD 9 Dark Purple Dust. 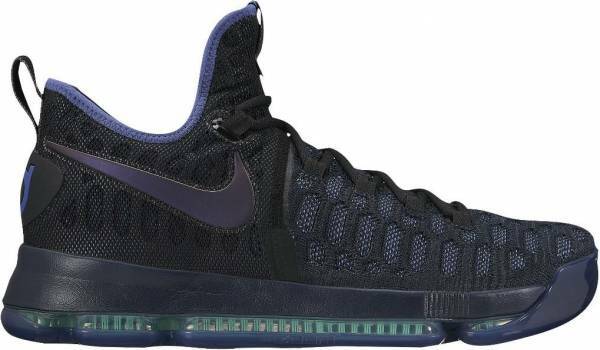 Released on Black Friday 2016, the Nike KD Dark Purple Dust has an obsidian and black upper with accents of blue on the collar, outsole, and rear KD logo. Nike KD 9 Mic Drop. A Nike classic, the Mic Drop colorway has a predominantly black upper with accents of white. Nike KD 9 Oreo. A reverse of the Mic Drop, the Oreo colorway is predominantly white with black accents. The white-speckled black midsole gives the colorway a twist. Nike KD 9 Triple Black. Also known as Anthracite, the Triple Black colorway is basically an all-black shoe. Nike KD 9 Varsity Red. The Varsity Red colorway is a simple red shoe with a white Swoosh and outsole. Nike KD 9 Wolf Grey. The Wolf Grey colorway is also called the “Pre-Heat” and “Cool Grey” colorway. These gray basketball shoes sit on top of a translucent outsole and are accented with a metallic silver Swoosh and pink Zoom cushioning. Just like other Nike basketball shoes, the signature sneakers of Kevin Durant were available at NikeiD for a more personalized experience. The Nike KD 9 was one of NikeiD’s Rise and Shine options. It allows new buyers to customize the inside of the tongue by adding a personal message or their initials and numbers. The shoe comes with an iridescent gold-foil upper. The midsole, Swoosh, and tongue underside has metallic gold accents. The Nike KD 9 Arizona Wildcats was made through NikeiD by a Wildcats assistant director of equipment operations. It has a black base with red accents on the Swoosh and forefoot area. The pull tab has an “ARIZONA®” callout. It also has an Arizona logo on the insole. The Nike KD 9 Duke Blue Devils was created through NikeiD. It is a PE colorway for the college basketball team of Duke University.